It’s not often you find a ski resort in the Alps which isn’t picturesque and jaw-droppingly beautiful. Where exactly are the most beautiful resorts in the Alps though? Well, we’ve had the pleasure of putting together a list of 10 of the most picturesque resorts in the Alps. Kitzbuhel town is about as picture perfect as you get, cobble-stoned streets and a charming section of shops and cafes. Like with many of the beautiful ski resorts in Europe, Kitzbuhel has a reputation for attracting the rich and famous, however, it is possible to find an average-priced apartment as well. Kitzbuhel town can very well be described as quaint and luxurious, the scenery is soft and naturally beautiful and the slopes are easy-going. Kitzbuhel draws the crowds during the hair-raising World Cup downhill race, Hahnenkamm. The snow is doused with water by staff to ensure for a perilous race. What may come as a surprise is aside from the World Cup, Kitzbuhel caters for skiers of all ability. In fact, not including the World Cup, Kitzbuhel isn’t scary at all. How to get there? Innsbruck Airport to Kitzbuhel transfer time is 1.5 hours. Unlike its lively Austrian neighbour St Anton, Lech enjoys a more laid-back and sophisticated atmosphere, with stunning panoramic views to match. The town is home to chocolate box chalets, luxury hotels and glamorous restaurants, it’s not hard to see why so many of the worlds rich and famous choose Lech as their ski resort of choice. That’s not even mentioning the picturesque surroundings. The 276km worth of pistes ensures there is ample skiing for everyone, due to the excellent links with its neighbours of St Anton and Zurs. How to get there? Innsbruck Airport to Lech transfer time is 1.5 hours. Saas Fee is a stunning traditional Swiss village, which is nestled between 13 towering peaks, reaching a height of 4000m, offering Himalayan-esque views. One great thing about Saas Fee is that the village centre is traffic-free, apart from electric vehicles. Solely electric vehicles mean that traffic noise is kept to a minimum. The narrow streets throughout this Swiss village are crammed with bars, cafes and quaint boutiques. Here’s a good fact for you, Saas Fee is so picturesque that it was the location for the video for Last Christmas – Wham! Here’s a good fact for you, Saas Fee is so picturesque that it was the location for the video for Last Christmas – by Wham! How to get there? Sion Airport to Saas Fee transfer time is 1.5 hours. The Tyrolean Alps in Austria bring skiers and snowboarders arriving in their flocks year on year. The attractive villages, including Alpbach, and exceptional ski areas, keep tourists coming back for more. The beautiful resort of Alpbach is one of the jewels in Austria’s crown, the superb skiing, picturesque surroundings and high-quality accommodation make this ski resort a true winter wonderland. Don’t just take our word for it, Alpbach was once voted Austria’s most beautiful village by the Austrians themselves. Alpbach is linked with 6 other ski resorts in the Ski Jewel area, which homes 145km of pistes and lifts up to 2128m. It’s here that you’ll be treated to stunning views of the Alpbach Valley peaks, the Ziller Valley and the Rofan Range. What more could you ask for from one of the most beautiful ski resorts in Austria? How to get there? Innsbruck Airport to Alpbach transfer time is 1 hour. Megeve is a charming traditional style French town, further afield the tree-lined runs are given a backdrop of spectacular views of Mont Blanc. It’s difficult to name a resort which comes close to the natural beauty of Megeve’s surrounding landscapes. Megeve is often touted as the French version of Switzerland‘s elegant St. Moritz, so it will come as no surprise that this resort is a playground for the rich and famous from around the world. The medieval style centre of Megeve is home to many top-of-the-range luxury hotels and chalets. 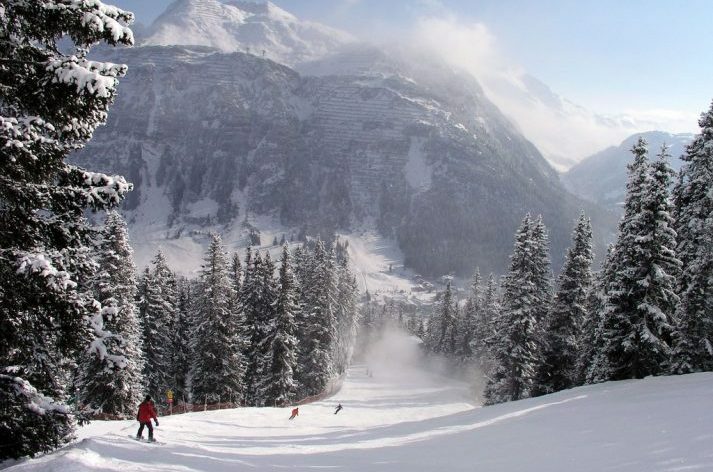 Megeve is part of the Domaine Evasion Mont Blanc ski area. The 325km of runs ensure that this ski resort is varied for all levels of ability. How to get there? Geneva Airport to Megeve transfer time is 1.5 hours. The jaw-dropping beauty of Zermatt is clear to see for everyone who’s ever visited this charming traditional Swiss town, which is nestled beneath the magnificent Matterhorn. Zermatt and the surrounding Valais region is a place that will never fail to charm its guests and locals alike. The panoramic views, a backdrop of the highest glacier in the Alps and the crystalline landscapes, ensure that Zermatt claims its spot as not only one of the most picturesque resorts in Switzerland and Europe, but in the world. The skiing in Zermatt matches the scenery, there are 313km of pistes and by far some of the best off-piste you will find in Switzerland, as a result of its height and guaranteed snow. The lifts are open throughout the majority of the year for glacier skiing. The village itself is also very charming, with impressive nightlife. Zermatt really has it all, doesn’t it? How to get there? Sion Airport to Zermatt transfer time is 1.5 hours. Known to some as the Queen of the Dolomites, this premier Italian ski resort is often compared to some of its French neighbours like Courchevel and Val d’Isere. 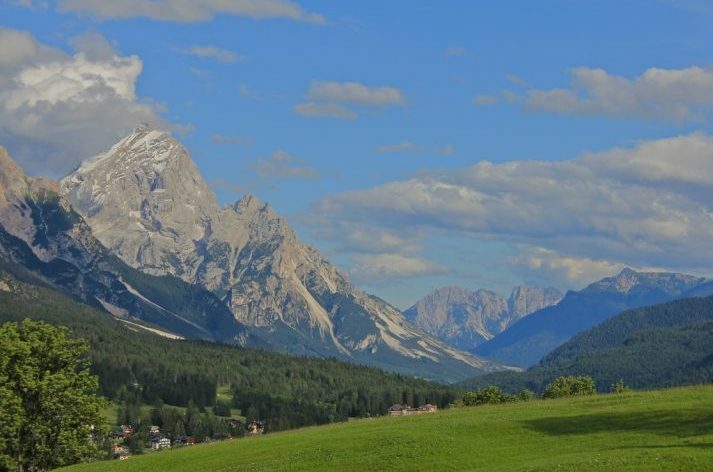 The beauty of the snow-capped Dolomite peaks ensures that Cortina d’Ampezzo claims its spot as one of the most beautiful ski resorts in Europe. The naturally beautiful and unique surroundings are clear to see when you arrive, making the perfect backdrop for this charming ski town. It wouldn’t be wrong to suggest that Cortina’s surroundings include some of the finest mountain scenery in the Alps. The Apres ski in Cortina ensures non-skiers won’t be hard pushed to enjoy their time in the stunning town. The ski area itself is packed with well-groomed pistes, ensuring the whole area is great for beginners and intermediate skiers and snowboarders. How to get there? Venice Airport to Cortina transfer time is 2 hours. Chamonix’s landscape alone is a sight for sore eyes, there are stunning spots everywhere you look, especially with Mont Blanc on the horizon. Head into the town and you won’t be disappointed, the charming scenery doesn’t end here. Take for instance St. Michael’s in Place de l’Eglise; the stunning silver spire, stained-glass windows that glimmer in the sun and cream walls to give that clean finish. There are 30,000 acres of skiable terrain in Chamonix (and the surrounding resorts in Chamonix Valley), so you won’t be pushed to find somewhere new to explore. The 9,000 strong population of Chamonix town ensure that this beautiful French ski resort is hardly a tranquil setting, however, that can be overlooked when you view Chamonix tremendous setting beneath the tumbling glaciers and cliffs of the Mont Blanc massif. How to get there? Geneva Airport to Chamonix transfer time is 1.5 hours. There’s no end to the reasons to love Meribel. The chalet-style architecture, friendly atmosphere and wooded surroundings are a good start. The stunning scenery ensures that even its biggest doubters are turned into lovers of Meribel upon arrival. There are plenty of reasons to love Meribel, not least for its pretty, chalet-style architecture, wooded surroundings and friendly, village atmosphere. 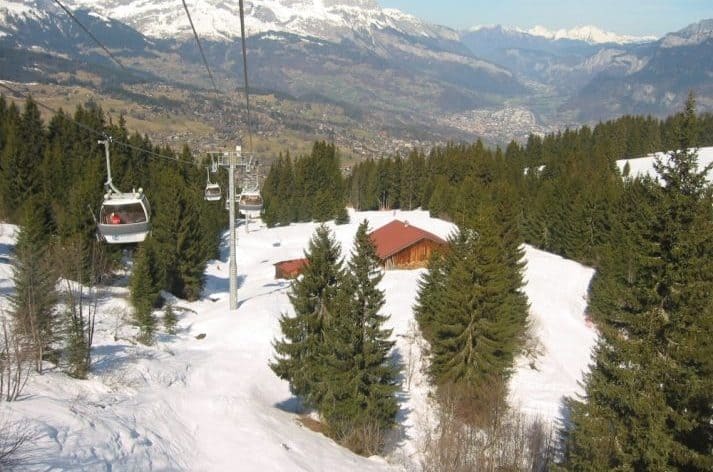 But the prime reason is its central position within France’s huge 3-Valleys ski area. Meribel is part of the famous 3-Valleys ski area. Meribel is one of the big names in French ski resorts. The highest lift stands at 3200m, there’s 600km of pistes, an excellent lift system and a great snow record, making Meribel and the 3-Valleys one of the most sought-after destinations in not only France but in Europe as well. How to get there? Chambery Airport to Meribel transfer time is 1.5 hours. Les Gets lies between Mont Blanc and Lake Geneva. There’s not only beautiful scenery all around, but there are also links to the incredibly popular Portes du Soleil ski area. The town is filled with cosy mountain restaurants, there’s a huge variety of accommodation and if you head here for Christmas, you’ll experience possibly the best Christmas spirit in France. Les Gets is a ski resort which caters for everyone. Family, couples and groups alike will find this picturesque resort in France more than enjoyable. How to get there? Geneva Airport to Les Gets transfer time is 1.5 hours.